Put the pasta to boil with some oil and salt. 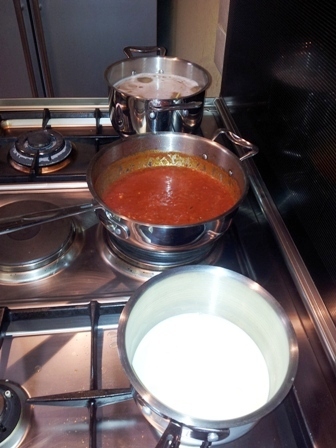 When it is cooked, drain and rinse with cold water. 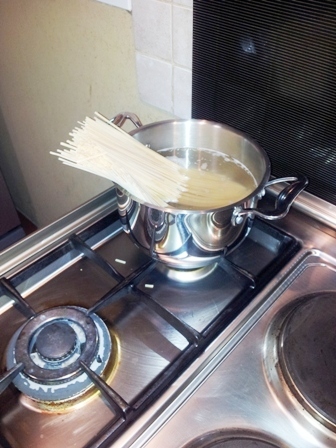 This process will prevent the pasta from sticking together. For the sauce, puree the canned tomatoes and the sundried tomatoes. Fry the onions in the butter and olive oil. Let is simmer for 10 minutes on a low heat. Add the garlic and the fresh herbs, after a few minutes add the dry herbs and cayenne pepper. Add the pureed tomato and salt and pepper to taste. Let it cook for about 20 minutes on a medium heat. In another pot heat up the cream, as it comes to the boil add the pecorino cheese. Leave a little of the cheese to crumble on the top of the pasta when serving. Once the cheese has melted add the creamy cheese sauce to the tomato sauce. Let this simmer for 10 more minutes then take it off the heat. 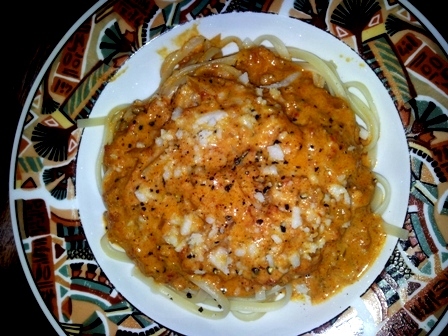 Serve the tomato pecorino sauce with the pasta. Bless you for the tips, and your web site really looks impressive. What word press theme are you employing? Thank you very much :). I am using a rtpanel theme.